When we built our timber framed classroom, one of the concerns was how best to heat it. We are entirely reliant on woodfuel here, and a regular woodburner was going to make a big dent in our precious wood pile. 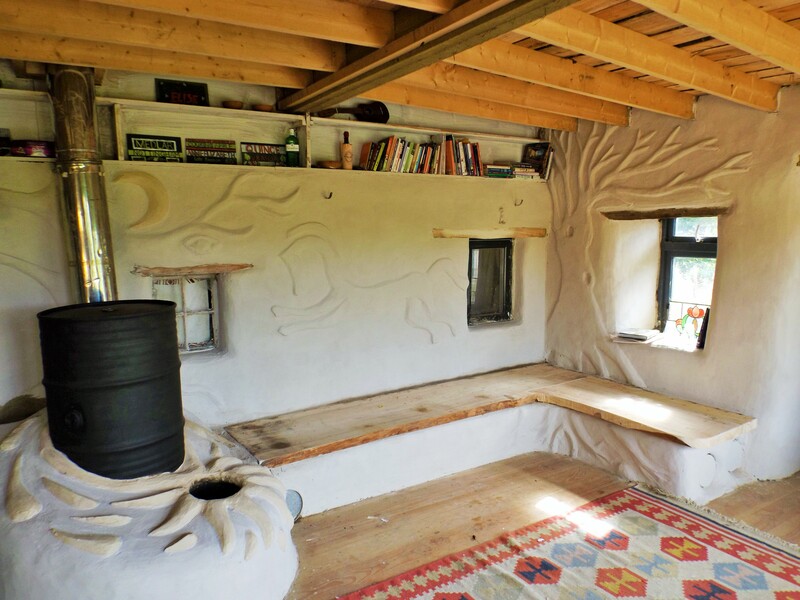 Then I saw a rocket mass heater in Permaculture Magazine, and it seemed the perfect solution. For those who haven’t encountered one before, the rocket mass heater (RMH) is a well proven though not widely used way to burn wood very efficiently, and then capture all the heat produced, in a mass – normally a bench or bed – by passing the flue horizontally through it. 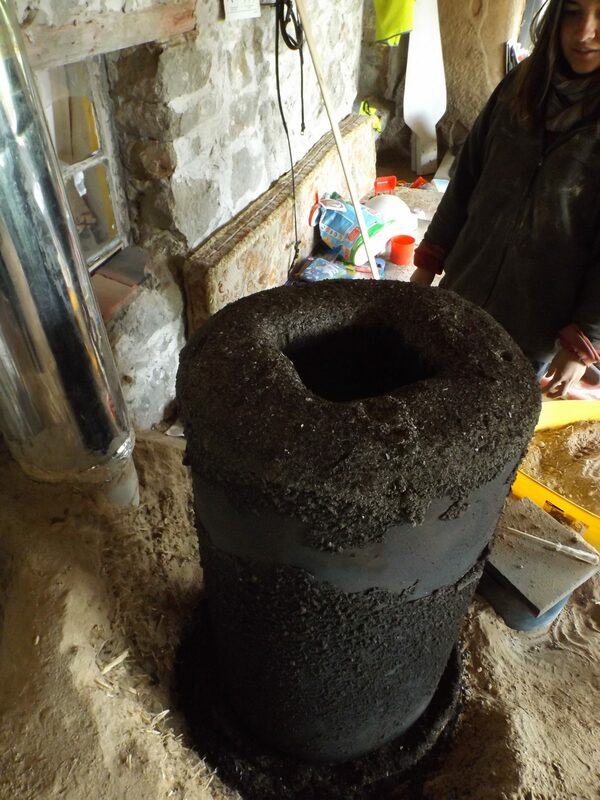 First it burns small fuel, which that we typically don’t use in our range cooker. Secondly, it burns very efficiently and thus cleanly, so less fuel is required. We were a little sceptical about the claims made for RMH’s, especially the cleanliness of the exhaust and the temperatures that could be reached inside the burner, but were intrigued and decided to attempt to build one. Something that requires a 20 foot horizontal flue, heat retaining bench, and 50 gallon steel drum needs to be designed as part of a building, and so it was here, the base of the heater being built at the same time as the foundations of the building itself. Although the basic design of the RMH is a relatively simple one, the devil is in the detail, and after reading as much as possible on the subject, we got ourselves a copy of Ianto Evans excellent book ‘Rocket Mass Heaters’, and followed the dimensions as closely as possible – some of the proportions within a RMH need to be within quite small tolerances to work effectively, and the majority of those builders with problems seemed to be suffering because they had changed some element of the design. 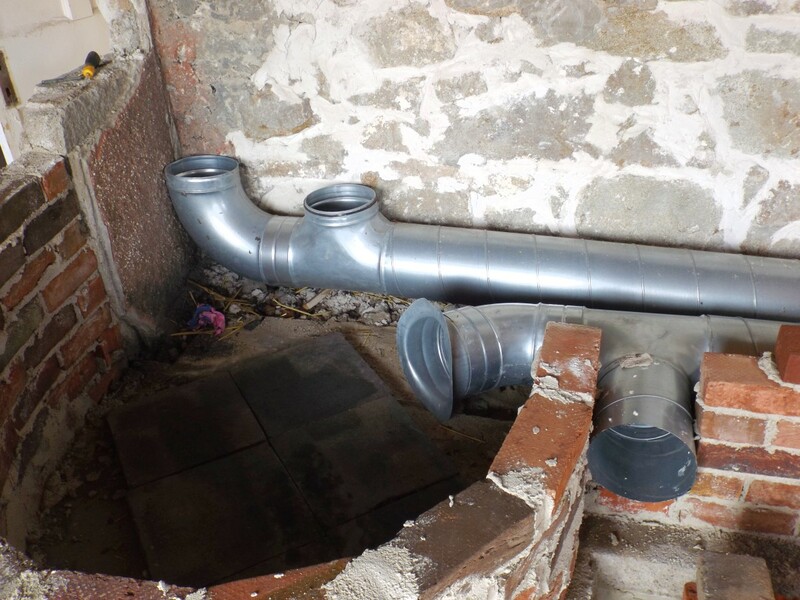 Some of the materials – brick, clay, and steel barrel, were easy enough to come by at no cost; the 8” spiral duct, firebrick and insulated flue had to be purchased, bringing the total cost to approximately £200. Normally we have great success in finding materials for nothing, but the firebrick and the sheer quantity of flue required for the mass eluded us this time. Initially all the parts were laid out to get an idea of scale, and then the base for the fire built up. We used a layer of glass bottles as an experimental insulation layer, with sand over, then paving slabs, set perfectly level. 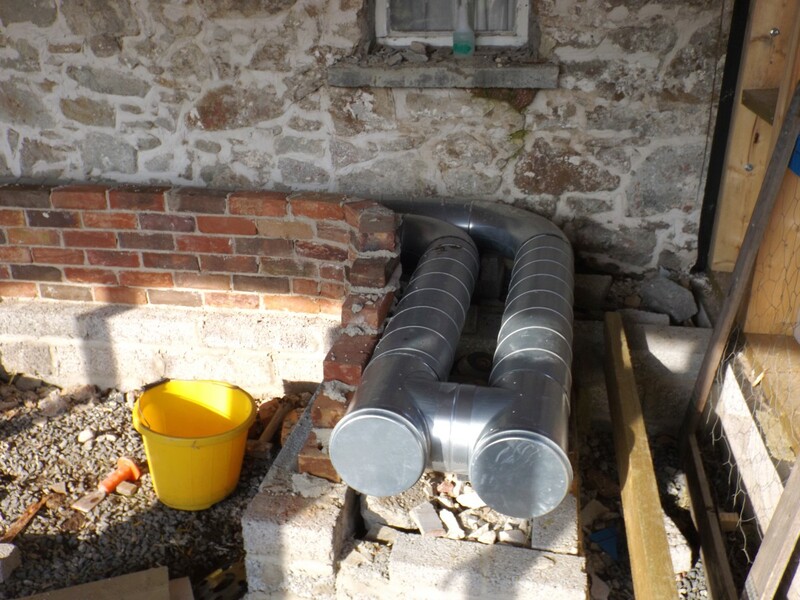 Having got the base ready, we laid out the flue – we used 8″ spiral duct in the bench, which has an inspection cap each time it changes direction to allow for easier cleaning later on. 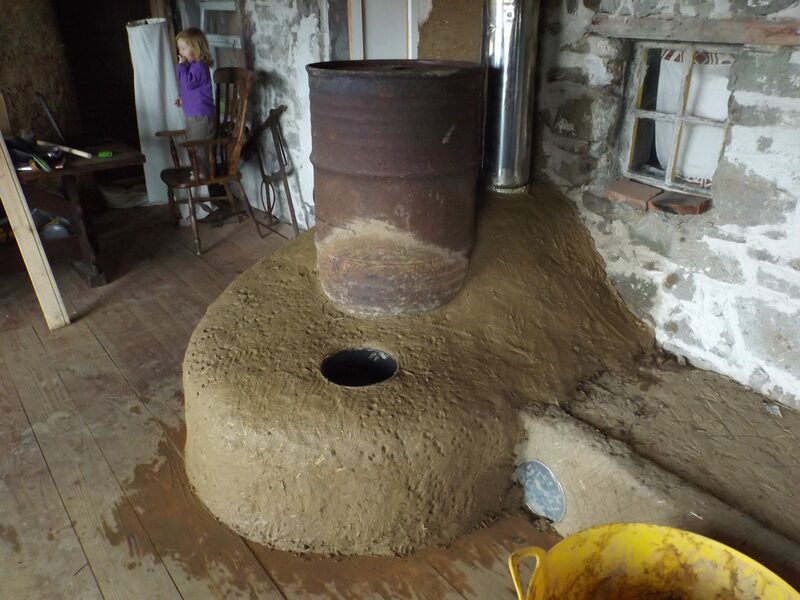 So (above) at the back, you can see two openings – the left one will be a cleanout with a cap on it, the next one is where the vertical triple wall flue comes off and exits through the roof. The one in the middle is where the exhaust from the burner enters the flue, and the one on the right is yet another cleanout. 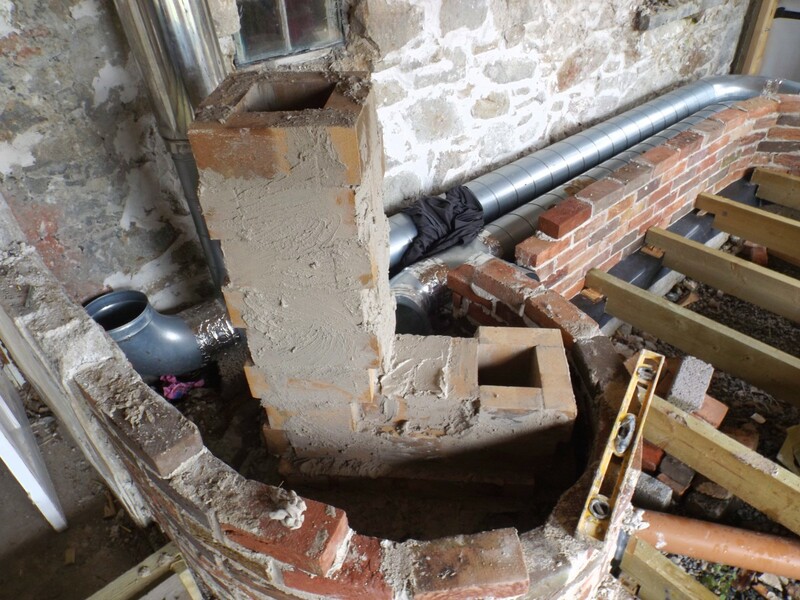 Here we are starting to lay put the combustion chamber – the firebrick could be substituted with old red brick, and is joined together using a mortar made from pure clay and very fine sand in the ratio 1:1. Having tried (and failed) to get clay soil cleaned up enough to make smooth clay mortar, I just went out and bought some clean clay, which was thirty quid well spent. 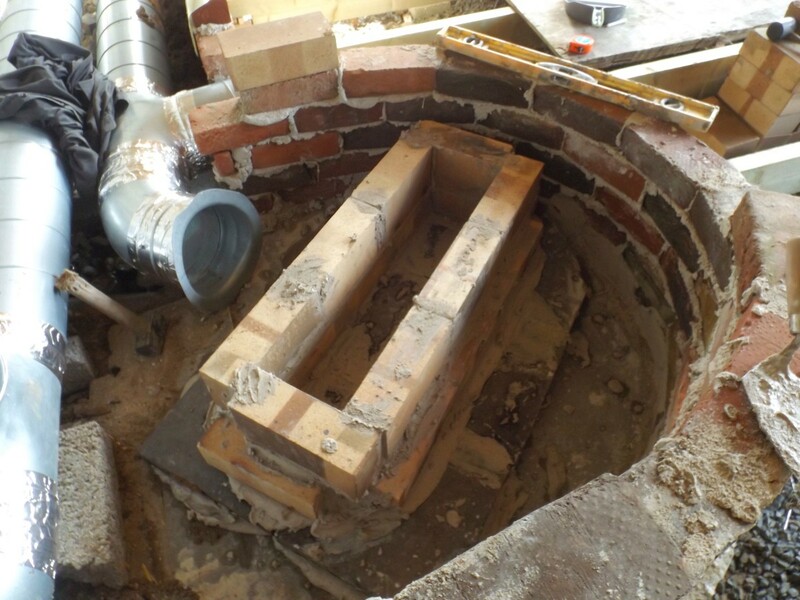 The firebrick is built up to form the opening where the fuel will be fed in; the burn chamber, and the base of what will become a vertical chimney inside the outer steel drum. The ducting is all properly jointed and sealed now, and here you can see the burner built up as far as the top of the fuel feed (right) and the bottom of the riser (left). 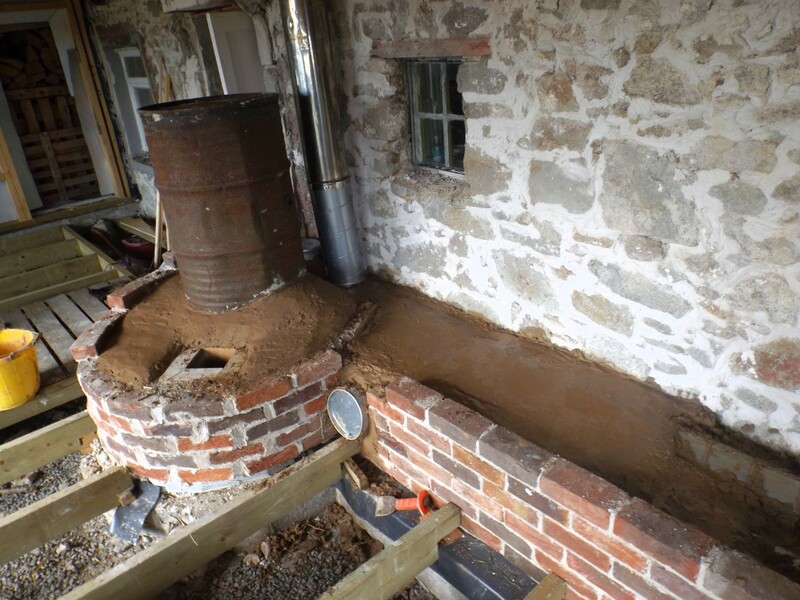 Building with firebrick and very smooth clay mortar means the joints are very small – down near 1/16″ to keep as much heat in as possible and the fire super efficient. The next stage is to built up some brickwork around the base of the firebrick to take a metal cage, within which we can put vermiculite insulation. The aim is to insulate the entire burn chamber as much as possible to contain heat and increase the efficiency of the fire. 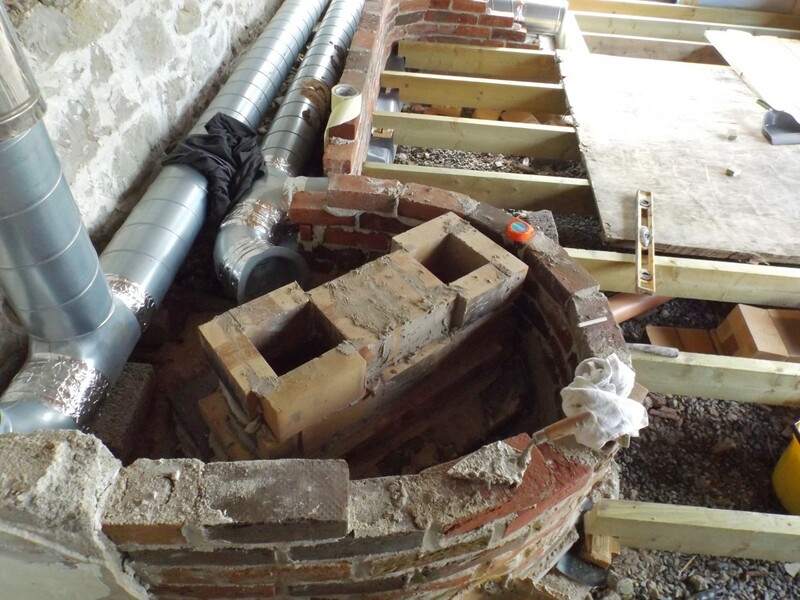 Here is the rather sooty inner drum built around the brick chimney, the outer drum having been removed for inspection and adjustment. The clay mix is a little hit and miss, but is roughly 1 part clay to 4 parts sand. 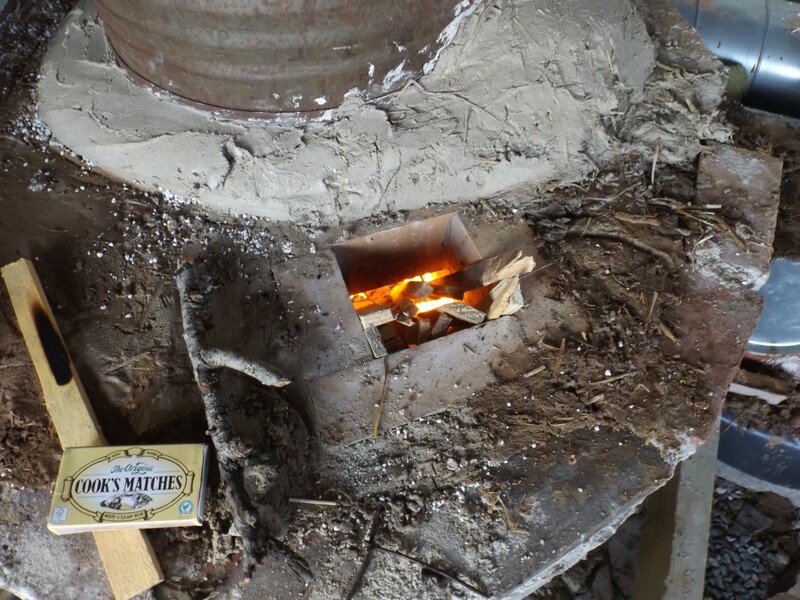 For areas around the burner we’ve stuck to using the clean clay bought from a pottery supplier. For everything else, it will be the locally dug clay, at around 1 sand: 3 or 4 clay. No straw in the bits immediately adjacent to the pipework, apparently, though its a bit late for that in one or two spots. We mixed and laid a couple of tonnes of cob in the bench, and it seemed that something had gone terribly wrong, as the excellent draught we’d seen seemed to have vanished, but persistence paid off, and as the cob dried out, and the fire put less effort into driving out moisture and more into heating the mass, things improved and we’re happy (and relieved) to report that all it now works. It needs to be used little and often to maintain heat in the mass, but once charged up it keeps a big space comfortably warm, and people and pets fight to get a spot on the warm bench. We are getting to know our heater and its little foibles now – lighting it from cold, or on a still day can be a challenge, and until it warms up it has the occasional cough back into the room, but persevere a little and it goes very well. It’s definitely one of those things that fascinates visitors, although the 50 gallon drum isn’t for everyone, and we’ve had many suggestions for ‘improving’ the look of it. Other than that it is a huge hit, and incredibly successful. Having got all this together, and dropped on the top part of the insulated flue, it was time for the moment of truth. Rocket Mass Heaters aren’t known for easy lighting, as until they get warm, there’s a tendency for smoke to blow back up the fuel feed. Other than a bit of initial smoke, it went really well, especially considering that it is trying to dry out a load of clay mortar along its way. The barrel got nice and hot, while the insulated flue stayed cool, and the exhaust really was a little smoke, and mostly warm steam, just like I’ve seen in countless videos. I don’t know why, but I’m still surprised it actually works.. In this short video you can hear the distinct ‘rockety’ sound that gives these stoves their name. When we built our timber framed classroom last year, one of the concerns was how best to heat it. We are entirely reliant on woodfuel here, and a regular woodburner was going to make a big dent in our precious wood pile. 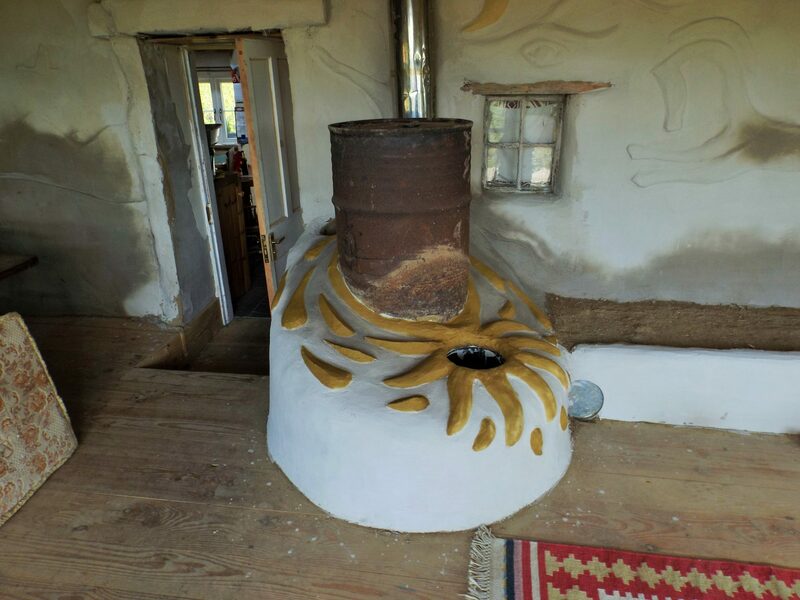 Then I saw a rocket mass heater in Permaculture Magazine, and it seemed the perfect solution. For those who haven’t encountered one before, the rocket mass heater (RMH) is a well proven though not widely used way to burn wood very efficiently, and then capture all the heat produced, in a mass – normally a bench or bed – by passing the flue horizontally through it.